This book is a portrait in words, filled with vivid descriptions of scenes and locations that are by turns devastating and breathtakingly beautiful. This is fitting in a sweeping dual biography of two brothers who lived for art. Following the lives of the painter Vincent van Gogh and his brother Theo, an art dealer, Deborah Heiligman tells a story of devotion, tribulation, and turbulent genius. Vincent and Theo were born and raised in the rural Netherlands, sons of a Protestant pastor. After attending school, they both worked for art dealers, though Vincent attended divinity school for a time. (The question “God or art?” would haunt him for much of his life.) As Theo rose in the art dealing profession and Vincent gradually branched off into painting, the brothers maintained a constant, moving correspondence, heavily quoted in the book, which keeps the reader invested in their struggles. This story is undoubtedly grim, with Vincent on the verge of starvation for much of the first half and both brothers always struggling in their private lives and their love lives. (Vincent allowed a penniless woman and her two children to live with him at one point, when he was already destitute.) 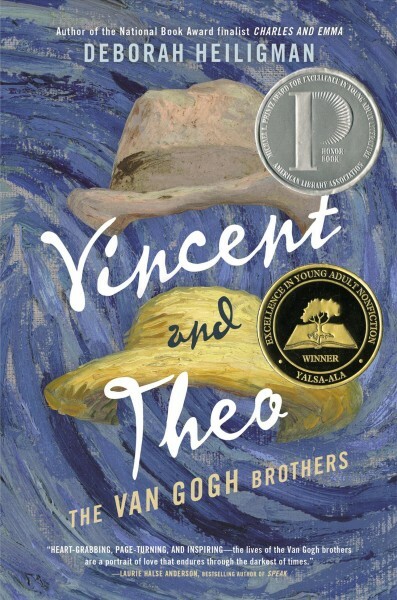 As Vincent grows more and more skilled as a painter (his most trusted critic was Theo), the story becomes slightly more hopeful, but misunderstood talent, poverty, and frustration propel both brothers toward a devastating end. I highly recommend this book – 4 stars.